Roasted Sweet Potato & Turkey, Feta, Pecans, Granny Apple with Lemon Dijon Drizzle over Seasonal Greens. The best results are born of the best INGREDIENTS. 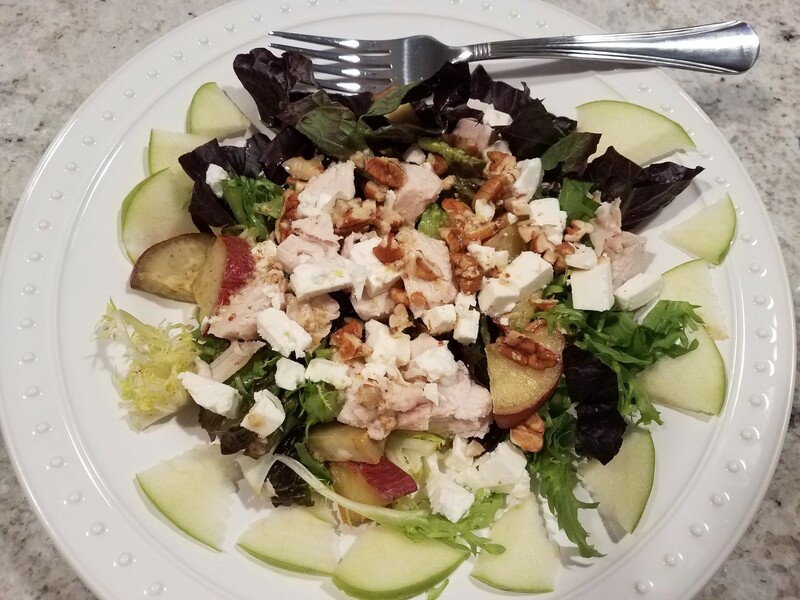 Here is how to build this salad with options to flow with your ingredients available…. Turkey: Put a boneless netted breast in the slow cooker. Perch it up on a halved onion and halved head of garlic so it won’t poach in its own liquid. Option: Use a halved lemon instead of the onion or garlic. Make a rub of ½ tsp each: paprika, oregano and thyme, ¼ tsp fine sea salt and 1 ½ Tbsp olive oil. Slather the rub over the top and sides of the turkey. Add chicken or vegetable broth so it remains under the turkey. A dash of vermouth or dry white wine would be a nice addition. A 3 lb turkey breast takes about 5 hours until it reaches an internal temp of 165 degrees F. Let it sit for 20 minutes after the internal temp is reached before cutting it. If you like, you can put it under the broiler, to brown the skin. Watch it carefully so it doesn’t burn. Option: If you aren’t cooking a turkey breast, buy the best turkey you can afford, avoiding any processed product with preservatives and sugar added. Extra turkey from the slow cooker makes great leftovers for sandwiches, soup or casseroles like turkey tetrazzini, turkey divan or my turkey asparagus bake recipe (I will post this recipe here soon). Sweet Potatoes: Roast the sweet potato just before serving so it is warm on the salad. For a serving size of two salads, roast one sweet potato. Scrub the potato with a veggie brush, cut the ends off (and any damaged spots) and slice it in chunks. Add a couple Tbsp of coconut oil. Bake at 400 degrees F on parchment lined pan for about 15–20 minutes. After five minutes in the oven, give it a stir to evenly distribute the coconut oil. It’s done when it is fork tender. Pecans: For two servings rough chop a ¼ cup of raw pecans. Feta: For two servings crumble or cut ½ cup. Option: Goat Cheese. Granny Apple: For two servings thinly slice ¼ of the apple. Option: Fresh Berries. Lemon Dijon Drizzle: Squeeze fresh lemon for 3 Tbsp juice, add 5 Tbsp extra virgin olive oil, 1 tsp Dijon mustard and whisk for salad dressing aka drizzle. Option: Add a tsp of honey. Greens: For two servings you’ll need about four cups of the freshest most appealing greens at your market. The photo salad has frisee and red romaine greens. Rinse in cold water, spin dry and chop or tear to desired size. Begin building your salad by putting greens on serving plates; adding and arranging largest to smallest on top…. Greens, Turkey, Roast Sweet Potato, Apple, Feta, Pecans and Lemon Dijon Drizzle. Finale Option: Top with ½ cup bacon crumbles. Use real bacon or turkey bacon.